This article by Lisa Song is re-posted by InsideClimate News. Two and a half years after the costliest oil pipeline spill in U.S. history, the company responsible for the disaster is balking at digging up oil that still remains in Michigan’s Kalamazoo River. The cleanup has been long and difficult because the ruptured pipeline was carrying bitumen, a heavy oil from Canada’s tar sands region. Bitumen is so thick that it can’t flow through pipelines until it’s mixed with liquid chemicals to form diluted bitumen, or dilbit. When more than one million gallons of dilbit poured out of the broken pipeline in July 2010, the chemicals evaporated and the bitumen began sinking to the riverbed. Today, regulators and oil spill experts are still struggling to deal with the accident, which was the first major spill of dilbit into a U.S. waterway. The cleanup tools and techniques developed for conventional oil spills—which mostly float on water—are ineffective for submerged bitumen, so experts have had to come up with new methods. In October, the U.S. Environmental Protection Agency asked Enbridge Inc., the pipeline’s Canadian owner, to clean up several miles of the river where submerged oil is still accumulating. The proposed order told Enbridge to dredge 80 to 100 acres of the riverbed. The request was based on the results of a yearlong study the EPA conducted with oil cleanup experts, Michigan state regulators and a committee of about 15 scientists. The dredging is needed, the agency said, because the oil could spread into uncontaminated areas of the river if it isn’t removed. Enbridge responded to the request by asking the EPA to delay issuing its final order until the agency completes some ongoing scientific studies. In a Nov. 2 letter obtained by InsideClimate News, the company questioned the EPA’s assertion that the submerged oil is “mobile” and could contaminate sections of the river that are already clean. 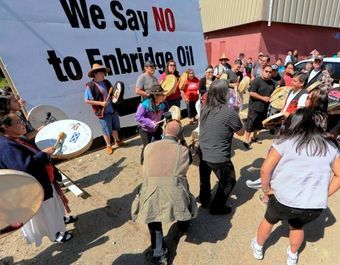 “Studies and activities are currently ongoing to better understand the extent, if any, of submerged oil transport, containment of oil and recovery of oil-containing sediment related to the Line 6B release,” Enbridge wrote. The EPA is drafting its response to the letter and declined to comment about its discussions with Enbridge. Nick Schroeck, executive director of the Great Lakes Environmental Law Center, said the Clean Water Act gives the EPA authority to order whatever cleanup it determines is needed. But in these types of cases, the agency likes to work with the responsible parties, he said, and make its orders as “least burdensome as possible” to avoid court challenges. Enbridge, Canada’s largest transporter of crude oil, was fined a record $3.7 million for the 2010 spill by the U.S. Department of Transportation. The National Transportation Safety Board blasted the company for a “complete breakdown of safety.” The EPA is conducting a separate investigation of the accident. The slow pace of the cleanup has angered Deb Miller, whose home is about 300 feet from Ceresco Dam, one of the locations targeted for dredging. When an area near the dam was dredged in 2010, Miller and her husband, Ken, lived for months with the noise of helicopters and machinery. So much heavy equipment blocked the roads by their nearby carpet and flooring store that their customers couldn’t reach them. 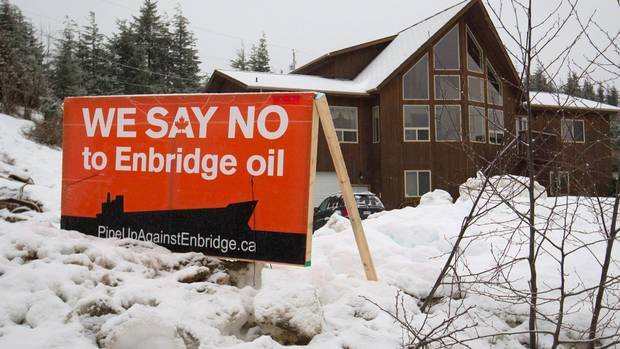 Still, Miller wants Enbridge to abide by the EPA’s order and dredge again near her home. “It just really frustrates me, that our federal government allows a company to put a product through [a pipeline] where they don’t know the effects and don’t know how to clean it up,” Miller said in an interview last week. In 2010, Miller testified before Congress about the spill and she has joined the New Voices Project, an outreach group created by the nonprofit Pipeline Safety Trust, which advocates for improved pipeline regulations and practices. Last fall, Miller took a garden rake and stirred up the bottom of the river. She said the oil “just came up black.” Now that the river has frozen over, there’s no visible contamination, yet Miller remains worried. Hamilton, the Michigan State professor, said the EPA committee is conducting a number of research projects, including examining the submerged oil’s effects on aquatic life, refining a hydrodynamic model to track the oil’s movement and analyzing the environmental impacts of dredging and the effectiveness of less intrusive methods of oil removal. He spoke with InsideClimate News as an individual scientist, not as a representative of the EPA. “My personal interest is to be more ready for the next spill,” said Hamilton, who has spent years studying the Kalamazoo’s hydrology and water quality. U.S. imports of dilbit are projected to quadruple in the next decade, and dilbit would be carried on the proposed Keystone XL pipeline, which crosses the critically important Ogallala aquifer. Earlier this month, the Nebraska Department of Environmental Quality concluded that a dilbit spill in the Ogallala would be less serious than a spill into surface water, because groundwater moves slowly within the aquifer. But the agency did not model the impact of a dilbit spill on Nebraska’s rivers or lakes. The debate over the Kalamazoo cleanup underscores how little is known about dilbit and how to remove it from waterways. To gauge the extent of damage after the spill, the EPA developed a method it calls “poling” to map the amount and location of the oil. Using hand-held poles, workers agitated the sediment in the riverbed to see if oil floated to the surface. They found that the current was sweeping clumps of oil downstream, allowing them to collect in low-lying areas, where they were sometimes buried in up to six inches of sediment. Results from the latest survey show that oil is pooling near Ceresco Dam, Mill Ponds and Morrow Lake Delta. Oil is also showing up in places that were once oil-free, and the EPA is concerned it could move further downstream during floods. “Poling is a rough, subjective method to determine the general location of submerged oil without accounting for volume, source of oil or potential for migration,” the company said in its letter. Hamilton acknowledged that the technique is flawed, but says it’s the best method they have given the unique challenges of this spill. “Poling remains to this day the only practical method of going out in the field and trying to find submerged oil,” he said. Enbridge also argues that the dredging would do more harm than good. Last year an InsideClimate News investigation of the spill showed that regulators and scientists have constantly struggled to balance oil cleanup with protecting the ecosystem. The EPA’s proposed order acknowledges that dredging is too destructive for some parts of the river. But it also says that after consulting its scientific committee and other experts, it determined that the benefits outweigh the potential damage in the three areas tagged for cleanup. Enbridge has used less intrusive methods in many parts of the river, including agitating sediment and collecting any oil that floats to the surface. In its letter objecting to the EPA’s plan, it said it prefers to continue with those techniques. Under orders from the EPA, Enbridge used an even more intrusive method in 2011 to clean up Talmadge Creek, a Kalamazoo tributary that received the brunt of the damage from the ruptured pipeline. The creek was so badly contaminated that Enbridge had to essentially rebuild two miles of it. “They dug out the whole stream and its valley, carted it [away] in trucks and brought in clean materials…It’s 100 percent new,” Hamilton said. The dredging the EPA is proposing now would be much less intrusive than that, but the process could still take months and substantially increase the cost of the cleanup, which already totals more than $809 million. 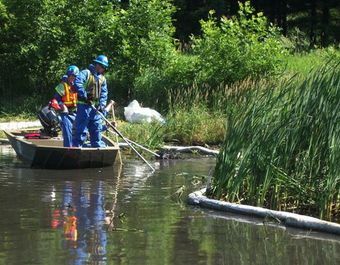 Before any work can begin, Enbridge will have to apply for permits from Michigan’s Department of Environmental Quality. Michelle DeLong, who leads a response team the MDEQ formed to deal with the Kalamazoo spill, said the permitting process would take at least a month. If Enbridge ends up dredging 100 acres, it would be “a pretty large scale operation,” she said. A staging ground would be needed for the heavy equipment, and Enbridge would have to submit a detailed work plan to the MDEQ. Impacted property owners would have an opportunity to comment on the plan and could request a public hearing. If that happened, DeLong said the permitting process could extend to two months. Hamilton said the EPA will conduct another survey of the submerged oil in the spring, which could alter the dredging plan. But he doesn’t expect the oil to move much over the winter because the river is running low after a severe summer drought and there’s been little rain over the past few months. As the EPA struggles with the cleanup, Michigan authorities continue to assess the spill’s impacts on human and environmental health. Wesley, the fisheries expert, said little is known about how bitumen will affect the aquatic ecosystem. Most of the impact would be on mussels, insects and other macroinvertebrates, he said, and any problems they experience would in turn affect the rest of the food chain. Michigan’s Department of Community Health determined last year that contact with submerged oil could cause skin irritation but no long-term health effects. The agency is still studying the health risks posed by the chemicals that evaporated into the air after the spill, as well as the risks of eating fish from the river. Deb Miller, the Ceresco resident, said concerns about the spill’s long-term effects forced her and her husband to close their carpet store on Nov. 30 and accept Enbridge’s offer to buy selected properties along the river.